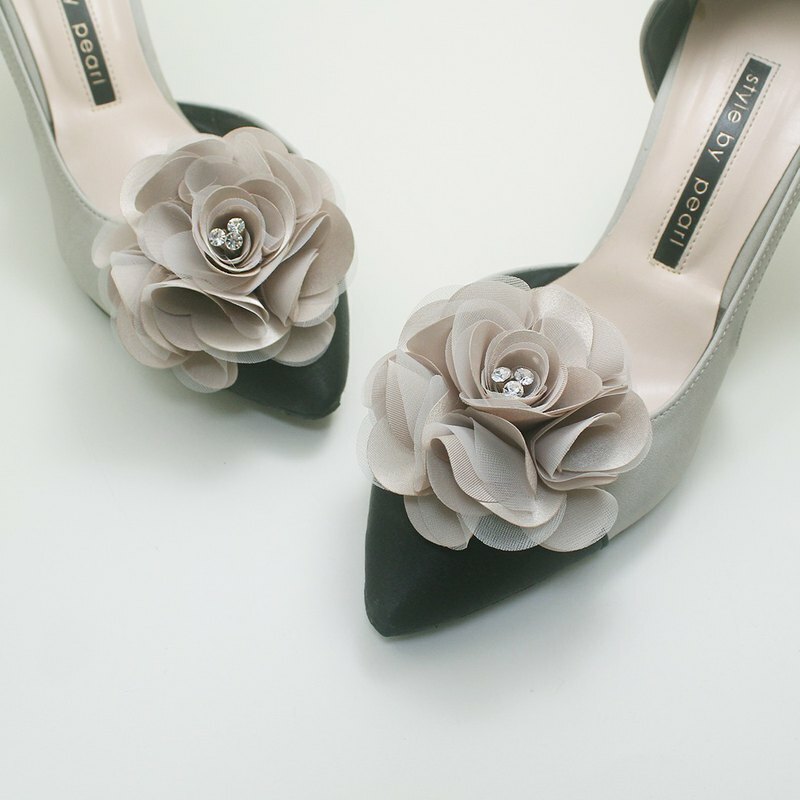 hello~ Let me introduce you these Elegant flower shoe clips. The clips are attached to steel shoe pins. This gorgeous piece is fashionable bridal shoes clip size of clip corsage :7.5* 7.5 cm Quantity : 1 pair (set of 2, Only Shoe Clip , Not Shoes ) color:mocha Materials: rhinestone, satin Detail : Attached to a small metal clip on the back side. Thank you for visiting my shop! and please come again. ------------------ Make Magic on Shoes in your closet ~ These beautiful shoe clips can be decorated for Wedding, Party, or for when you want to refresh or change your mood. They are detachable for any scene or dress and make your shoes shiny and gorgeous. We are carefully working with the details one by one, however, there may be a significant size difference (1 to 3 cm) and distortion. Please understand as handmade goodness. No refund and/or exchange is allowed after purchase. Please bear in mind that the items may slightly different from actual items in terms of color due to the PC monitor. ※ If you are allergic to metal or metal plating, please refrain from placing an order. -------------------------------------------------------------- [Shipping policies] I ship items from South Korea to all over the world by Airmail. (registered mail :Provide tracking number) Generally,it takes 20~30 working days after shipping via Registered mail ( except holidays ) This is just an estimate since actual delivery time depends heavily on the efficiency of custom process or your local post office condition. But if you need items urgently, I can ship it via EMS. It usually takes 3~5 working days. In this case, you should pay additional shipping cost. If you really concerned about your package, I recommend EMS shipping service. [Notic] 1.Please the color you see on the monitor may be slightly different from the actual colors of Goods 2.This item is handmade and for reference only, and so each one cannot be 100% identical, slight variations (about 1- 3cm) in size are to be expected. 3. If you experience any skin discomfort after using this product, please consult your doctor and discontinue use. 4.Since accessories are classified as personal hygiene products, returns or exchange is not accepted. 5.However, you may return an order and request for a refund, partially or in full, within 7 days counting from the day after the order arrives at the recipient’s address in the following circumstances, I am responsible for the shipping fee of returns. - Defective product - Incorrect product (from actual order) Please ensure that the product, packaging, accessories, free gifts, etc.) . If any items is missing or the packaging is not in the same condition, returns or exchanges may be denied. [Returns & exchanges] Refunds are only offered for defective products informed within 14 days upon After receiving the goods. Returning Goods Which are of Unsatisfactory Quality or Unfit for Purpose *** You can also return these items to us, but you will be charged for a round trip shipping fee. Item considered for exchange must be returned in “as new” condition, complete with all accessories and original packaging materials. All claims must be reported within 7 days after receipt of of item. [Additional policies] TAX Please check your local custom office for declaration details. We would not be responsible for any tax incurred.